In Home Senior Care Services | In Home Elder Care Services - Aging Better At Home, LLC. 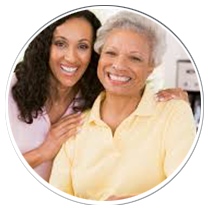 Our professional caregivers act as trusted partners to your aging family member while offering a friendly ear and capable hands. Your loved one benefits from consistent human interaction and assistance with the tasks of daily living allowing you to have the peace of mind that comes from knowing your family member is safe and cared for. Studies show that more than half of all seniors living at home are undernourished or malnourished. An unbalanced diet, the body’s inability to properly absorb food and depression are all possible causes. Aging Better At Home, LLC. Companion Care Services help support a healthy lifestyle by promoting healthy nutrition and encouraging the client to pursue mentally and physically stimulating activities. Remembering to take medications on time is a big challenge, especially for the elderly. Our professional caregivers can assist by reminding seniors to take their medications to help avoid unnecessary hospitalizations. Conversation and discussion of current events and life experiences to help sharpen memory and keep client mentally stimulated. Errands can turn into a never-ending list of chores that can quickly overwhelm an aging loved one. Aging Better At Home, LLC. Homemaker Services can provide transportation to doctors, hair appointments, grocery, drug store, post office or library. Our caregivers can also take your loved one to visit with family and friends, social engagements and outings to help promote well being and prevent social isolation. Outdoor activities like walking or gardening for fitness and to promote an active lifestyle. 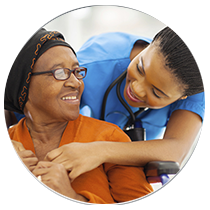 Our caregivers will monitor the home environment and report any safety concerns. As part of our Personal Care Services, our caregivers can prepare complete, nutritionally balanced breakfasts, lunches and dinners with the right portion sizes to insure that basic nutritional needs and dietary guidelines are met. Bathing and showering, a daily essential for good personal hygiene, may be difficult or unsafe for your loved one to do by themselves. Bathtubs and showers can be dangerous places, but our Aging Better At Home, LLC. caregivers can provide the help your loved one needs as part of their daily personal hygiene regimen. If your loved one struggles with getting dressed and undressed, either in or out of bed, our personal care services include help with this task, ensuring that your family member can look and feel their best. Our Aging Better At Home, LLC. caregivers have been trained to offer minimal to full assistance with restroom use, including incontinence care, all with the utmost respect, professionalism and sensitivity to privacy. If your loved one struggles with getting in and out of bed or a wheelchair, our Aging Better At Home, LLC. 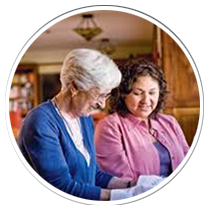 caregivers have specialized training in how to safely provide this home care assistance. Our Aging Better At Home, LLC. caregivers can help ensure the safety and cleanliness of your senior’s kitchen through light housekeeping services such as consistently cleaning the countertops, running the dishwasher, sweeping floors and putting clean kitchen items back in cupboards and drawers. By eliminating extra pots, plates or other items near the cooking area, it reduces the chances of an accident. By frequently cleaning stoves, toasters, ovens and other appliances, it keeps grease, oils and crumbs from building up and becoming a fire hazard. The bathroom, everyone’s private and personal sanctuary, can turn into one of the most dangerous rooms in the home for the elderly. A slippery floor or misplaced rug can cause a hazardous fall. The bathroom medicine cabinet, where many people keep their prescriptions, should be neat and organized to avoid mix-ups. Our Aging Better At Home, LLC. Homemaker Services can ensure that your aging parent or disabled family member’s bathroom is neat, clean and sanitized, creating the safest and healthiest environment possible. For your senior parent or loved one, a clean and neat personal appearance is still as important as ever—even if they are having trouble keeping up with chores like laundry and ironing. Our Homermaker Services can help your loved one relax and look their best with light housekeeping services such as washing, folding and ironing clothes. There’s something irresistible about climbing into a bed at night with crisp, clean sheets. And yet changing bed linens can be challenging for seniors and the disabled. As part of our light housekeeping services, our Aging Better At Home, LLC. caregivers will make sure your family member gets into a comfortable, clean bed every night. The services included in light housekeeping are those that maintain an orderly living space that allows the person being cared for to exist in a clean environment with peace of mind that daily tasks are completed for them. Light housekeeping includes things like watering the plants, dusting of surfaces and knickknacks, as well as picking up newspapers, magazines and other clutter. It also includes emptying the trash, vacuuming and sweeping of main walk areas. In summary, light housekeeping can be defined as completing the specific tasks required to tidy up areas that a client uses on a daily basis. Aging Better At Home, LLC. understands that taking care of a loved one with physical limitations or memory loss can be both a rewarding and demanding job. Respite care offers family caregivers temporary relief from caring for individuals with various needs. An essential part of an overall home care support strategy, respite care helps reduce family stress — helping preserve the family unit, support family stability and prevent lengthy and costly out-of-home care. Aging Better At Home, LLC. respite care service can be provided on an as needed basis, as a regularly scheduled respite or on an emergency basis. Taking time to do something for yourself that you enjoy, shopping/dinner with friends. Being a caregiver is a very difficult job and this can sometimes cause social isolation. Relaxing and talking with friends can improve your overall mood. Whether going on a quick weekend trip or planning a family vacation you will have peace of mind that your loved ones are in their own home and their needs are taken care of. Giving yourself some time to just relax and getting away from your caregiving situation for a few hours can improve your overall mood. You as a caregiver have the right to enjoy life without feeling guilty, it is so important to take care of yourself. This time you take to relax can make you a better caregiver. Being responsible for caring for your own family and your parents can sometimes cause issues for your spouse and small children. It is hard to focus on what is going on with your immediate family if you are pulled in too many directions with trying to care for everyone’s needs. Respite care can give you a chance to focus on what you are doing at the moment, without being distracted and thinking about what you should or could be doing for senior family members. Aging Better At Home, LLC. is a Home Care Agency headquartered in Wolcott, Connecticut and serving Connecticut's Central Naugatuck Valley including the communities of: Waterbury, Middlebury, Cheshire, Prospect, Naugatuck, Beacon Falls, Oxford, Thomaston, Plymouth, Bristol, Bethlehem, Watertown, Woodbury and Wolcott. Aging Better At Home, LLC. is a provider of non-medical services caring for seniors in the comfort of their homes.